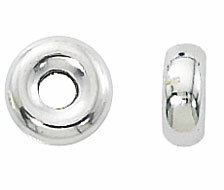 .925 Sterling Silver 8mm Smooth Rondelle Beads w/2.6mm hole. Anti-tarnish finish. Per Piece.